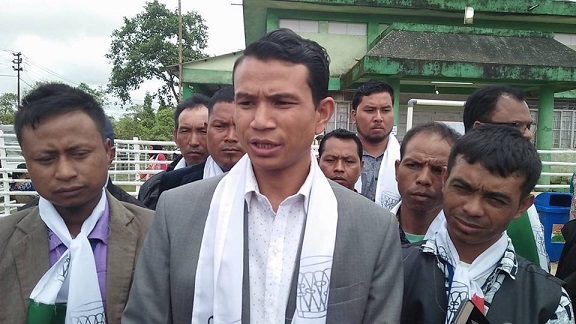 Newly elected legislator of the United Democratic Party (UDP) from Ranikor constituency, Pius Marweiñ took oath as member of the 10th Meghalaya Legislative Assembly on Thursday. Speaker, Donkupar Roy administered the oath to Marweiñ at his chamber in the Assembly Secretariat at Khyndai Lad here. Deputy Speaker Timothy D Shira, ministers and MLAs of the coalition Meghalaya Democratic Alliance (MDA) government and UDP leaders attended the oath taking ceremony. The UDP, an ally of the NPP which is leading the MDA government, has seven MLAs in the 60-member Assembly. Marweiñ defeated five-time MLA, Martin M Danggo, who resigned as Congress MLA and contested on NPP ticket in the by-election on August 23. “I have analyzed the votes in Ranikor. Danggo retained 90 percent of the original votes but our candidate (Marweiñ) could plus more than 4,000 votes from the last election in February. Who are these 4,000 plus voters? Our candidate got maximum supporters of NPP, BJP and People’s Democratic Front in the last election. I do not know how many Congress supporters voted for us, may be small number. We do not have mutual understanding with the Congress and it is only a speculation,” the UDP chief said. He also reasoned how the Congress can support the UDP candidate when they have their own candidate in Ranikor? “Is that the way Congress supported us by setting up candidate? The Congress got only over 900 votes from the original votes of Danggo,” Donkupar said. On whether the UDP would bargain for more cabinet berth in the MDA government after winning from Ranikor, Donkupar said that it was only ‘hearsay’ as one or two individuals might have this opinion, but not the party.